RMBLR PLAY THE NAME GAME! Hot new Atlanta rock’n’roll punks RMBLR release their debut EP next month and are sharing the lead track with Vive Le Rock! ‘Name Game’ is taken from the EP Territory which is released on 7″by Fat Possum on 17 February. 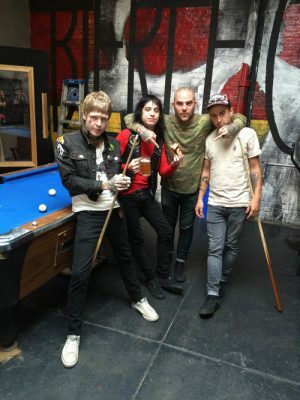 Pronounced Rambler, the band comprises the excellently punk-named Chase Tail (guitar/vocals), Alex Hagen (guitar/vocals), Jason Boyer (bass) and Jake Berry (drums), four punk mercenaries who emerged out of the touring line-up of legendary Atlanta Band, the DINOS BOYS. Following in a grand tradition of both rock’n’roll and punk, they cite such reliable influences as CHUCK BERRY, THE SAINTS, THE COLOURED BALLS and THE KIDS. Download ‘Name Game’ from the band’s Bandcamp page. ‹ NORMAN WATT-ROY CELEBRATED IN NEW EXHIBITION!